The first factor of authentication (something you know, such as password or PIN) is the weakest factor. Why? it makes sense when we say that humans/users are the weakest factor in any system from security point of view as we humans forget, make mistakes and break easily. But it makes no sense (to me a least) that getting kidnapped and tortured (in order to give up my password) is more likely to happen than me losing a smart card or a key fob? In the typical case, something you are and something you have can only be true for one person at a time. If you lose your token, you know you have lost it. Something you know can be copied by someone without your knowledge. If someone has your password, you may not be able to tell that they are actively exploiting that knowledge. That is one reason to change your password regularly. It shortens the window where a password breach could be exploited. Passwords, or more generally something you know, are often relatively weak, because users cannot remember high-entropy secrets. As a result, passwords (or anything you need to memorize) usually ends up being a low-entropy secret, which enables random guessing, offline dictionary search, and other attacks. While it's possible to create and remember a pretty good password, experience shows that users don't -- and that it is probably unreasonable to expect users to do so. Are there any academic articles on how people handle their passwords? See the entire passwords tag on this site. In addition, any secret you know can potentially be phished (i.e., someone might be able to social-engineer you into revealing it). Charlie Kaufman, Radia Perlman, Mike Speciner, Network Security: Private Communication in a Public World. At this point you might be wondering: Given the passwords have so many issues, why do we still use them? If so, I recommend you take a look at this question: Why do we even use passwords / passphrases next to biometrics?. You cannot possibly convey this info to another person, and any success in one login conveys zero success in another. For "something you know" to be effective, we should simply use aspects of human nature that work effectively. Most people can recognize previously seen face photos - it is built in. This is the result of the excellent marketing done by biometric authentication vendors. "Something you are" is sometime very easy for an attacker to reproduce, fingerprints and voice are especially easy to obtain, without the possibility for people to use credible strategies to avoid it (wearing gloves at all times and not speaking in public is not practical). Most of us likely leave dozens of exploitable fingerprints everyday, I for one don't say my password out loud nearly that often. "Something you have" is not without faults either, and requires a great deal of user education to be used properly. E.g. in any RSA SecureID company, a tour of the office will reveal many of them on desks, the code being visible. I even saw people carrying them around their neck with them. Also the disappearance of an authentication token may not be noticed until it is needed. The biggest (and only) problem of password based authentication is that its strength is set by the user, and there is a strength-usability tradeoff. In theory, passwords have lots of great properties for an user: they are hard to obtain from third parties by force, you don't leak them everywhere like biometric data, they can be stored as hashes unlike biometric data, users can stay anonymous to the service (if you share your mobile phone number for 2 factor or give them your fingerprints you lose that), users can tell the password other people, and share access. Try that with biometrics, or key fobs. 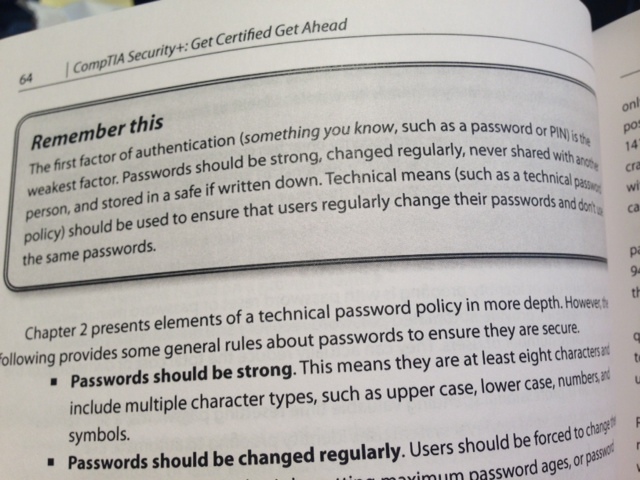 So passwords offer more control to the user, which can be an advantage, but most times is a disadvantage. Then there are problems in implementation. First you need to set a completely distinct password for every place you have to use a password. This is because most times the other party gets your password in plaintext. When you use a strong authentication scheme like SCRAM-SHA1, you never transmit the password to any third party, and can use a scheme like "strong password" + "website name" for your password. This usage of passwords however is very unclear to separate. You can create a small device where users enter their passwords into, which guarantees that the password never leaves it, but the user can be spoofed by the computer and think they have to enter it there. There it is again, the strength relies on the user. How does multi factor authentication modify the AD authentication process?